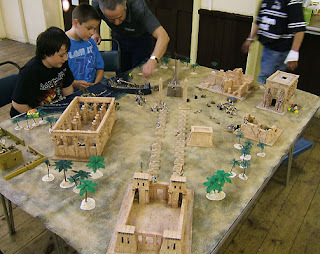 The game was a raid on ancient Egypt by Mycenaean warriors, that went horribly wrong. 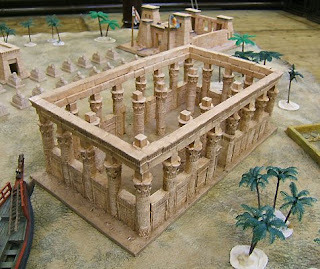 The genesis of the game started with the buildings. Lloyd started making them and got a bit carried away. 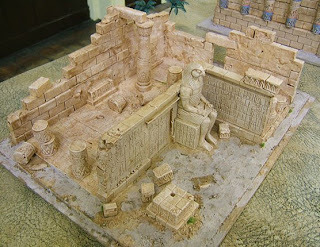 After the summer, he had enough stone temples and ruins to cover a table, but no Egyptian figures. 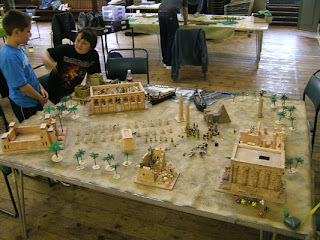 However, another club member, Peter, had painted up a load of "Tomb Warriors" by Citadel Miniatures, and so the possibility arose of a game between Lloyd's Trojan War figures, and Peter's band of walking undead. Homer in The Odyssey writes of a raid by King Menelaos of Sparta against Egypt, arriving by sea in search of loot near the coast. Homer doesn't mention whether the defenders were uncommonly skeletal. The game was designed for three players. Two ships arrive at the game's start, each with one contingent of treasure-hunting warriors, and these were in competition with each other for the most loot. 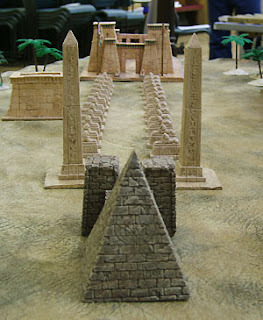 The third player (Lloyd) controlled the defending undead, and acted as a referee, also controlling the actions of the local townsfolk and wounded Egyptian soldiers. The red ship was commanded by two boy players, who were quickly distracted by the goings on in the local town, the corner of which was represented on the board. they shot dead in their enthusiastic blood lust. They are young, and they will learn. 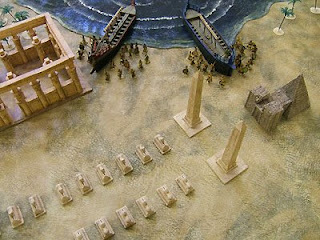 The blue ship's men soon found a wounded Egyptian, who might have warned them usefully of the presence of the undead who had taken over the temple area, but before he could make himself understood, they threw javelins at him and finished him off. Soon, inevitably, the undead appeared, and in quite large numbers. 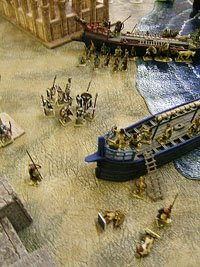 The undead on the blue ship's side of the table outnumbered the blue contingent's scattered men, and though many skeletons were smashed in the fighting, many Mycenaeans fell. 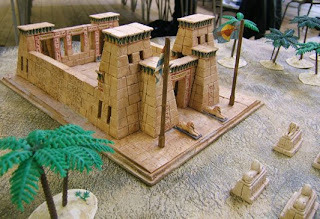 The commanders of the red ship contingent rejoiced to see their rivals in such a pickle, and carried on looting the town, missing out on the great treasures to be found in the temples. The leader of the blue ship got himself safely aboard the red ship, and couple of his men managed to escape from the overwhelmed blue ship, and swim across to the blue ship before it launched. 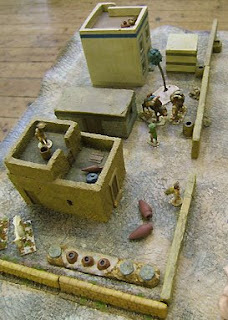 The beach was left littered with the dead and dying, and the game ended with one ship's escaping, manned by many wounded men. The cost of the raid was far greater than the gains. 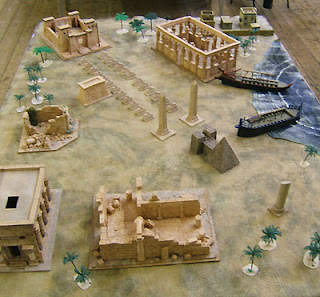 Had the two contingents fought as one from the outset, they would have been easily capable of defeating the skeleton defenders, and perhaps making it to the temples in the far corners of the table, where the great treasures were to be found. 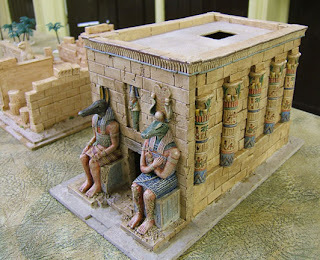 There too was the sarcophagus of the undead leader, inside the temple of Anubis, and destroying the mummy inside would have freed the place from the undead curse. Still, you live and you learn. Or you die and you don't. An enjoyable game, that went right down to the wire.